Chandra observations of the galaxy NGC 1365 have captured a remarkable eclipse of the supermassive black hole at its center. A dense cloud of gas passed in front of the black hole, which blocked high-energy X-rays from material close to the black hole. This serendipitous alignment allowed astronomers to measure the size of the disk of material around the black hole, a relatively tiny structure on galactic scales. 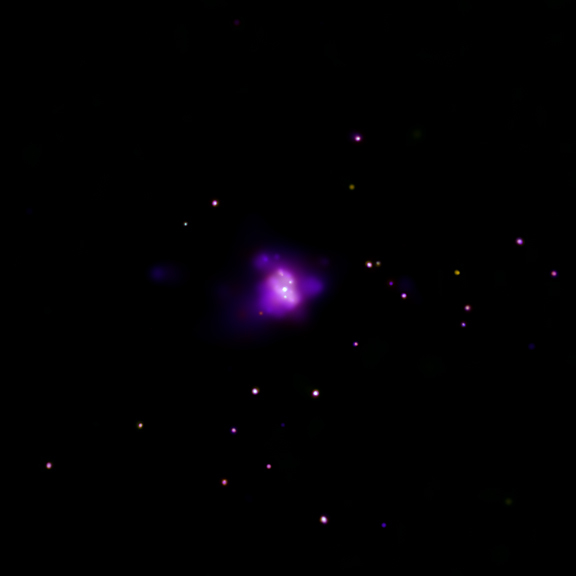 The Chandra image (shown in the inset) contains a bright X-ray source in the middle, which reveals the position of the supermassive black hole. An optical view of the galaxy from the European Southern Observatory's Very Large Telescope shows the context of the Chandra data. NGC 1365 contains a so-called active galactic nucleus, or AGN. Scientists believe that the black hole at the center of the AGN is fed by a steady stream of material, presumably in the form of a disk. Material just about to fall into a black hole should be heated to millions of degrees before passing over the event horizon, or point of no return. 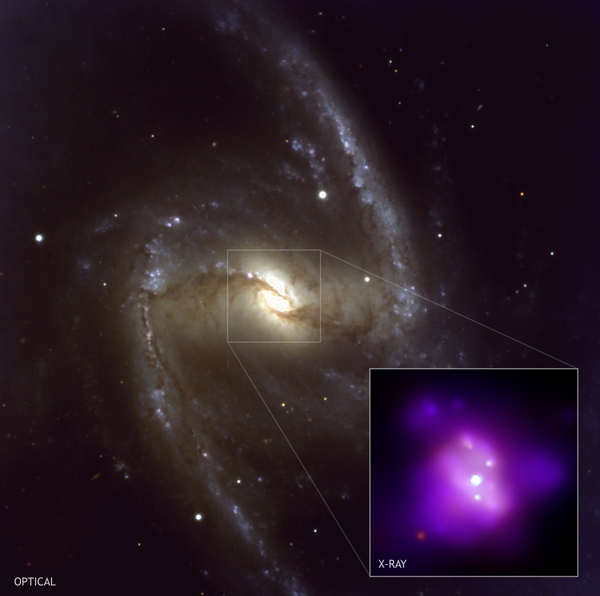 The process causes the disk of gas around the central black hole in NGC 1365 to produce copious X-rays, but the structure is much too small to resolve directly with a telescope. However, astronomers were able to measure the disk's size by observing how long it took for the black hole to go in and out of the eclipse. This was revealed during a series of observations of NGC 1365 obtained every two days over a period of two weeks in April 2006. During five of the observations, high-energy X-rays from the central X-ray source were visible, but in the second one -- corresponding to the eclipse -- they were not. Coordinates (J2000) RA 03h 33m 36.40s | Dec -36° 08´ 25.00"